SWOT analysis is popular and very intuitive method of evaluation business or any project. It is used in many situation of strategic analysis especially in first stage of project. This type of analysis can be useful in evaluate your business, product, job or employer. Main feature of SWOT is discribe subject in four aspects: strenghts, weakness, opportunities and threats. First two categories is internal features. They are independent from enviroment. Second two categories is external features. They enrich evaluation of all factors that are independent on you. To all feature can be assigned weight. Sum of this weight (strenghts and opportunities will improve the result, weakness and threats will worse the result) is result of analysis. SWOT is only first stage of evaluation of your project, but is easy and give complete view from the beginning. To prepare SWOT analysis you can use i-swot.com tool. You can add many futures to analysis and show it on more atractive form than simple text document. Tool is free in use and your data are saved only on your local disk. Click on image or use „Tool” menu above to create new analysis. 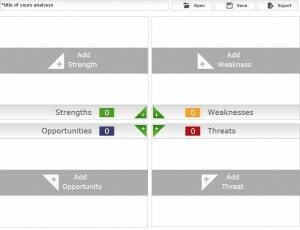 You can also see sample analysis made using i-swot.com. Click on image or use „Sample analysis” menu above to see its.